The DSX500i is a high-resolution inverted motorized scope with 13x zoom optics. This scope offers a new level of inverted metallographic microscopy with its operating simplicity and absolute reliability. The DSX500i provides a new way to see. No need to look through eyepieces, everything you need is on the screen. Operate the instrument with touch panel or mouse. What's more, virtually anyone of any experience level can use this new system efficiently. The screen guides the operator through the process, from inspection to measurement to analysis to final report. Short, simple steps. Quick results. Select Tutorial, Operator or Advanced Mode to best match the experience of your operator and the job at hand. Operator Mode can be customized to match operator experience or to speed up routine work. The operator's ID and password open the application, and automatically sets the scope to the operator's preferred mode, observation, analysis, and measurement settings. This customizable mode is ideal for routine work as all non-essential menus can be eliminated. In the past, operators had to make complicated adjustments on their microscope to achieve their desired results; with the DSX500i, it's simple. 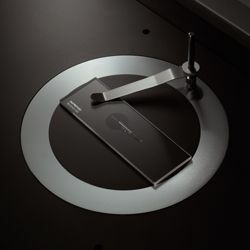 Once the sample is in place, everything is controlled by touch screen, computer mouse or joystick - inspection position, focus, zoom, illumination, and choice of inspection methods. All controls are direct and easily performed. In addition, auto-focus and auto-gain ensure illumination and focus are correct. As you adjust the zoom magnification to a higher level the area you can see at one time is reduced. The system automatically records a full field of view image in a separate macro window. On this full field image your location on the sample is noted and updated as you move your sample. In addition, if you use the panorama function it will be displayed in the macro window to provide the same convenience on an even larger area. Change the magnification to fit your needs with the DSX optical zoom. 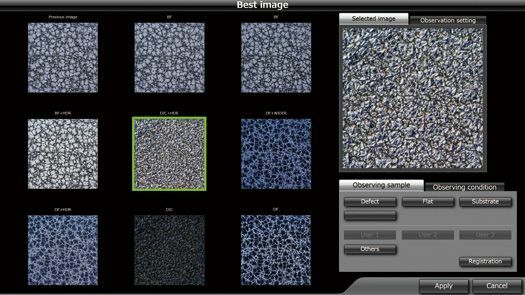 You can also select specific magnifications, such as 100x, 400x, etc., in order to meet industrial standards (ISO, ASTM, DIN, JIS) for observing metallographic structures. The DSX500i lens provides an optical zoom of 13x and digital zoom of 30x. The leading-edge digital technology of this microscope lets you see more than any other microscope can. Before, only experts with years of experience could adjust microscopes to achieve optimum images. The DSX500i allows any operator to do that with an easy to use interface. Now all it takes is a touch of the finger to follow a few easy steps to achieve the ideal image for inspection or analysis. Now you can operate your system just by choosing the image that works best for you, and the DSX500i will set the necessary parameters to achieve that image. That ensures the best possible image, whether looking for defects, uneven surfaces, or foreign objects. Anyone can operate the system, beginner or expert, and it can be customized for each operator or advanced user. Samples may appear differently depending on the quality of material, surface conditions, or illumination methods. The High Dynamic Range (HDR) function on the DSX500i combines several images taken at different exposures to very accurately correct brightness differences on the sample surface. HDR provides high-fidelity images that show not only textures but also flaws and defects that were undetectable before. Glare can also be reduced for more comfortable observation. If the non-reflective area cannot be seen, merely increasing the illumination power is often not enough, because glare can occur. Olympus intelligent image processing technology eliminates these problems with WiDER, a proprietary system that works effectively with live images, is ready to go at the click of a button, and takes care of the high contrast problems in real time. No blackouts. No glare. With virtually every industrial observation method at hand, it's easy to choose the proper one for the current task. No complicated adjustments needed. MIX combines BF with DF LED illumination, something conventional microscopes cannot do. With bright-field visibility and added dark-field detection capabilities, defects and imperfections can easily be detected. Bright-field observation. The most common method with optical microscopes. Dark-field observation. Illuminate from the side to emphasize imperfections. Best method for identifying defects. Differential Interference Contrast observation. The method to use when inspecting uneven surfaces or nanometer level imperfections. Simple polarized light observation. It is a valuable technique for observing surface with polarized characteristics, such as polished metal. Use bright-field (BF) and dark-field (DF) observation methods at the same time, a mix of BF ease of observation and DF ease of detection. The DSX500i requires no extensive knowledge or special techniques to show you exactly what you want to see. By calling on leading-edge electronic technology, you can now see what was unclear or impossible before. On the DSX500i there is no such thing as "outside the field of view." Just move the observation position on the screen, and the motorized stage will move the sample to that place. As the stage moves, the system automatically stitches images into a single large field of view, in real time. Where conventional microscopes reduce field area with increases in magnification, Panoramic View maintains the original field while giving closeup clarity - with 2D, extended focus or the combination. Panoramic photos - Use the mouse or your finger to select the areas you want to see. For example, even the most carefully polished sample will show different heights where different materials meet. With conventional system at high magnification, such unevenness is out of focus and indistinct. The DSX500i moves the focus to the higher portion of the sample and creates an image of the entire field that is perfectly in focus. Color enhancement mode highlights the color you want to see and leaves the rest in monochrome, making it much easier to find defects. The DSX500i offers a motorized stage so that it moves to exactly where you specify, and acquire images (2D, EFI) according to the conditions you set. The acquisition conditions, including stage coordinates, observation method, etc. can be saved in a file and recalled at any time. This means that any operator can easily repeat any inspection and measurement. With the DSX500i, you can perform an observation or measurement, and the system will automatically generate the relevant reports. Olympus guarantees the reliability of the DSX500i microscope because they are born of Olympus optical and digital technology. Glare is minimized and color reproduction is real. And to make sure of that, Olympus uses the perfect combination of CCD chip and graphic board. The sample is reproduced with such accuracy it's like a new dimension. The DSX Series is the culmination of Olympus long history of superior engineering and design capabilities as well as proven manufacturing quality. In the clear images produced by the DSX500i opto-digital microscope, you'll find neither flare nor distortion, unheard of in other digital microscopes. 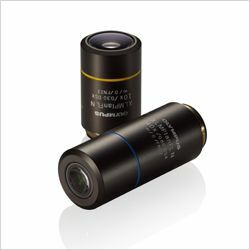 These new 10x and 40x lenses were designed and manufactured for the DSX500i. They combine high NA and wide-field view as never before. Just zoom in and achieve extremely high resolution. What's more, you can also use other standard Olympus UIS2 lenses. 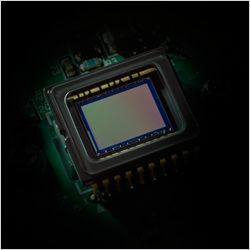 Olympus High-performance CCD is the engine that shows exactly what our high-quality optics reveals. The image shift function ensures high fidelity with fine detail processing, so the clarity extends from corner to corner. New LED illumination not only assures accurate observation, but also provides low running costs. Most importantly, the color does not change with the LED's intensity thus minimizing the need for white balancing. And the long working life of the LEDs means the instruments are virtually maintenance free. The DSX500i shows Olympus dedication to accurate measurement with its telecentric optics and stabilized frame design. The measurements are accurate and repeatable. The DSX500i provides precise and repeatable measurements. The accuracy is traceable to national standard. Proper calibration is crucial to precise measurements, and with the Olympus DSX500 series, any operator can calibrate simply and accurately. This eliminates any differences that occur when different operators calibrate. Any DSX500i microscope comes equipped for 2D measuring items that are required for an inverted metallographic microscope. And the result of inspection and measurement can be reported by the same application software. The DSX500i frame provides stability even at high magnification, and the anti-vibration function further eliminates any additional blur caused by vibration. This software ensures accurate measurement. 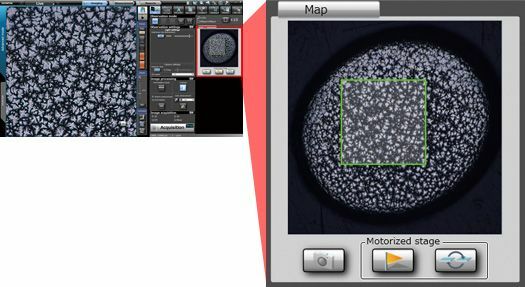 Granularity analysis, cast iron analysis, non-ferrous metal inclusions analysis, chart comparisons-virtually every analysis necessary in metallography evaluation can be done with OLYMPUS Stream image analysis software*. At the touch of a button, Olympus Stream software starts up and accesses all the data in the DSX500i files, including basic calibration data, and offers a diverse and flexible workflow that moves from measurement to analysis to report production.